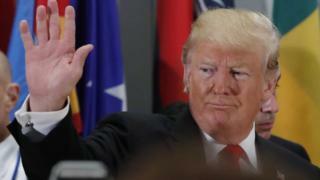 US President Donald Trump is expected to voice fresh criticism of Iran later when he chairs a UN Security Council session on the non-proliferation of weapons of mass destruction. It is only the third time a US leader will have presided over the body. 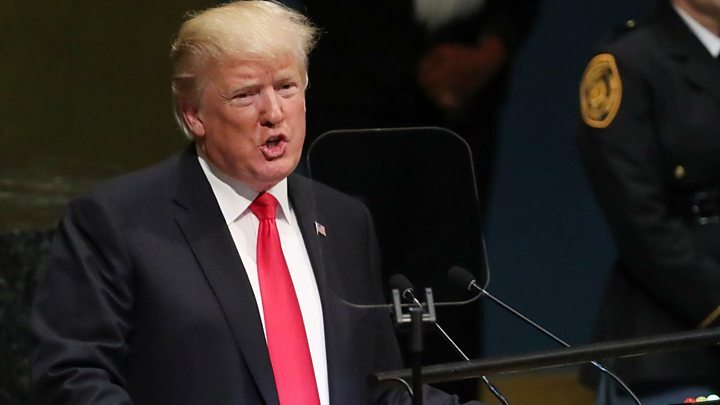 On Tuesday Mr Trump accused Iran’s leaders of sowing “chaos, death and destruction” in an address to the UN General Assembly in New York. Iranian President Hassan Rouhani described the US as a “bully”. Iran is not a member of the security council but President Rouhani is planning to hold a news conference after the meeting. The war of words continued when US National Security Adviser John Bolton warned Tehran later on Tuesday there would be “hell to pay” if it harmed the US, its citizens or its allies. The US recently imposed sanctions after leaving the 2015 nuclear deal. The move has exposed divisions between the US and its European allies. What is expected at the UN? Wednesday’s session will not be focused on any one particular country but will allow world leaders present to express their views on ways of countering weapons of mass destruction. However, in a recent tweet, President Trump said he would “chair the United Nations Security Council meeting on Iran”. US-Iran relations have been sour for decades and Mr Trump has rarely lost an opportunity to criticise Tehran. Do US sanctions increase risk of war? The BBC’s Nick Bryant in New York says open meetings at the Security Council are usually heavily scripted and the council president is expected to adhere to formal wording. However, the council chamber is probably the closest thing in international diplomacy to a corporate boardroom and precisely the type of stage Mr Trump relishes, our correspondent adds. When the meeting starts, he will make a statement and then all council members will follow. It is expected to take about two hours for all the speeches to be heard. Mr Trump will be in the chair because the US currently holds the rotating presidency of the security council. What is the latest US criticism of Iran? Mr Bolton, the former US envoy to the UN, told an event on the sidelines of the General Assembly that the “murderous regime” in Tehran would face significant consequences if they continued to “lie, cheat and deceive”. Mr Bolton, who has argued for military action against Iran in the past, also said the US would be aggressive in enforcing economic sanctions. The US State Department on Tuesday issued a report detailing what it said was the “scope of the Iranian regime’s destructive behaviour at home and abroad”. The report said Iran had “a stockpile of hundreds of missiles that threaten its neighbours in the region”. What did Trump say at the UN? The US president defended his decision to abandon the 2015 accord, negotiated by then President Barack Obama, which saw Iran limit its nuclear activities in exchange for sanctions relief. “Iran’s leaders sow chaos, death and destruction,” Mr Trump told the general assembly. 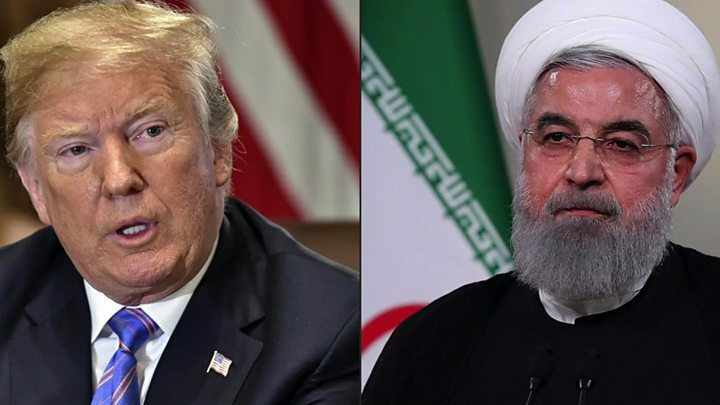 Mr Trump believes renewed sanctions and economic pressure will force Iran to agree to a new deal. Mr Rouhani told the UN General Assembly that dialogue should begin by ending threats and what he called “unjust sanctions”, adding that no nation could be brought to the negotiating table by force. “The economic war that the United States has initiated under the rubric of new sanctions not only targets the Iranian people but also entails harmful repercussions for the people of other countries, and that war has caused a disruption in the state of global trade,” he said. What have other key nations said? The remaining signatories in the nuclear deal – the UK, China, France, Germany and Russia – say they will set up a new payment system to maintain business with Iran and bypass US sanctions. However, the plan has infuriated the US, with Secretary of State Mike Pompeo condemning it as “one of the most counterproductive measures imaginable”. “I was disturbed and indeed deeply disappointed to hear remaining parties in the Iran deal announce they are setting up a special payment system to bypass US sanctions,” he said.